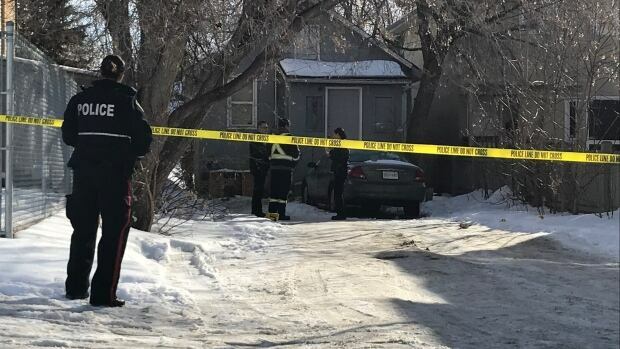 A Saskatoon prosecutor says a teen charged with second-degree murder should be sentenced as an adult if he’s convicted of killing Mark Enwaya. Ainsley Furlonger gave verbal notice in youth court Tuesday that prosecutors would make that application should the 17-year-old be convicted. The Crown’s notice was just one element in a dramatic morning in courtroom No. 2 at the Saskatoon provincial courthouse. Court had to be briefly adjourned when Enwaya’s family stood and began shouting and crying when the teen accused of killing the 31-year-old came into the prisoner’s box. And disturbing details emerged about the alleged murderer’s background when his lawyer, Michael Nolin, applied for a psychiatric assessment. Nolin said the teen was under psychiatric care and had gone to just a single appointment when Enwaya was fatally shot with a .45-calibre handgun in the alley behind the 100 block of Avenue Q South on March 10. Nolin said the 17-year-old showed “very curious behaviour” when he met with lawyers after getting arrested. Nolin said the teen had no memory of the shooting and was “unable to pass basic cognitive tests” that Nolin gives some clients. For instance, he was asked to memorize one of four colours – blue,yellow, red, or green. Minutes later, he could not recall the colour. Nolin said he suspected that the youth is suffering from post-traumatic stress disorder. He said that a year ago, when he was 16, the youth was unlawfully confined and stabbed seven times. He believes that the teen is still suffering the after effects of that assault. Judge Sanjeev Anand ordered a fitness to stand trial assessment, and a not criminally responsible (NCR) assessment. The NCR assessment helps a judge to determine whether a person who was suffering from a mental disorder at the time they committed an offence was criminally responsible for their actions. The assessments will be done at Saskatchewan Hospital. The teen will return to court May 23. His 15-year-old co-accused is due back in court April 16.